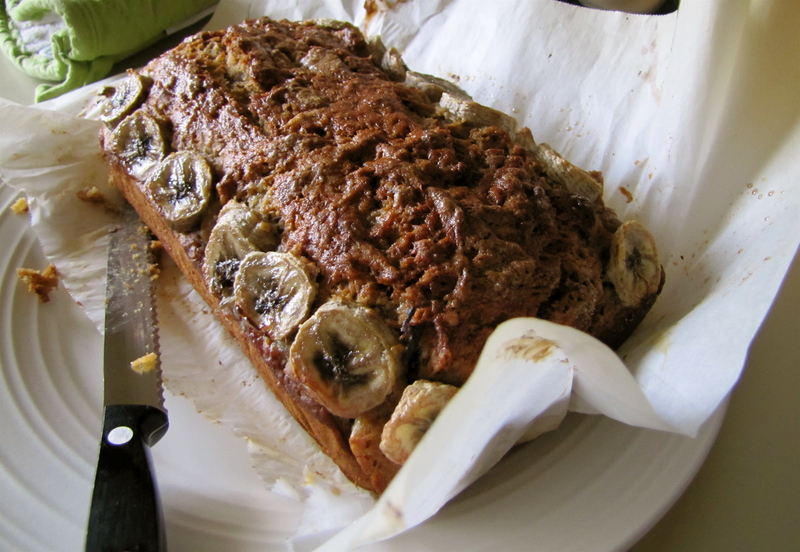 Ultimate Banana Bread – Voila! There was banana bread. Then there was the best banana bread. Then there was even strawberry-banana bread. And now, I present to you, the ultimate banana bread. Why ‘the ultimate’? It has six bananas! You must think I’m going bananas for including so many, but trust me it’s good. This recipe is slightly more labor intensive than other banana bread recipes, but, trust me again, it’s worth the effort. Now, you may ask – well, if you have so many banana bread recipes, which one is your favorite? Well dear reader, that’s hard to say. What I would need to do is make each one and then test taste them. Until then, I’ll be diplomatic and say they’re all good! 1. Whisk flour, baking soda and salt in large bowl. 2. Place 5 bananas in microwave safe bowl. Cover with saran wrap and cut several steam vents in plastic with paring knife. Microwave for 5 minutes until bananas are soft and have released liquid. 3. Transfer bananas to strainer and place over bowl. Allow juices to drain, about 15 minutes. If you have about 1/4 cup of juice then proceed to the next step. If you have 1/2-3/4 cup, then pour liquid into small sauce pan and reduce until it measures 1/4 cup. 4. Put bananas into medium bowl. Add banana juice and mash with potato masher until smooth. Add butter, eggs, brown sugar and vanilla and whisk together. 5. Pour banana mixture into flour mixture and stir until just combined, leaving some streaks of flour remaining. Gently fold in nuts and/or chocolate chips, if using. Pour batter into prepared loaf pan. 6. Slice remaining banana diagonally into 1/4-inch thick slices. Arrange slices along either side of loaf pan. Sprinkle sugar evenly over the top. 7. Bake for 55-60 minutes, or until inserted toothpick comes out clean. Loved the banana flavour in this, but it was very heavy and a bit on the greasy side. Going to play with it a bit, thanks for the inspiration!